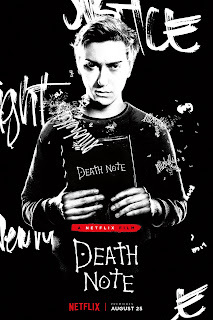 A high school student finds a magical book that lets him kill anyone he wants just by writing their name in DEATH NOTE. Based on a Japanese manga which was, in turn, previously filmed as an anime feature film, director/writer Adam Wingard’s version tries to adapt the premise for western audiences. The student in question is Light Turner (Nat Wolf), a smart kid who sells term papers and is still coping with the murder of his mother. Once he finds the book and starts reading it, a demon named Ryuk (voice of Willem DaFoe) appears and explains that he can kill anyone Light wants him to, provided he writes the victim’s name in the book and can concentrate on their face. Light decides to use this newfound power over life and death to be something of a superhero, taking out the kind of bad guys his policeman father (Shea Whigham) often has to let go due to technicalities. Sort of a supernatural Dirty Harry, if you will. Light also lets his crus Mia (Margaret Qualley) in on his secret. Once she’s convinced this power is for real, she becomes even more enthusiastic about taking out the bad guys. Light decides they can do even more good if they claim their kills for some kind of omniscient, vengeful god, and starts signing his work with the name Kira. This brings in eccentric detective L (Lakeith Stanfield), who joins forces with Light’s dad (the only cop on the force who doesn’t support Kira’s vigilante killing spree), precipitating a game of cat and mouse. On the plus side, Wingard’s direction is strong, imbuing DEATH NOTE with the same kind of visual style seen in his 2014 film THE GUEST. In fact, one could easily see this as a companion piece to that film, dealing with similar ideas about how vigilantism can seem like a good thing at first, and then quickly spiral out of control. 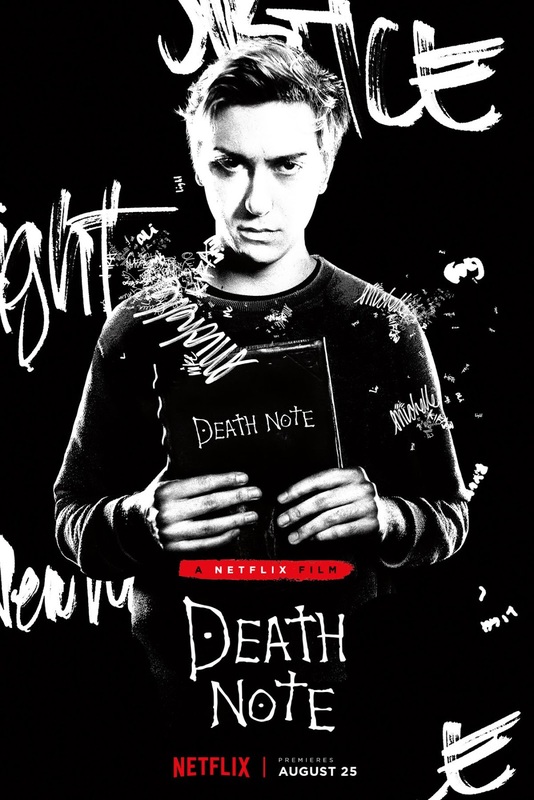 Like THE GUEST, DEATH NOTE boasts a great ominous synthesizer score and carefully thought out color palette, and even features a major third act scene set in a high school dance. Add in the compelling concept and a great cast, and it should be a recipe for a really good movie. Unfortunately, there are problems that can’t be overlooked. Rightly or wrongly, DEATH NOTE has been accuse of “whitewashing” it’s Japanese source material. I’m not sure that’s entirely fair in this case. Regardless of how you feel about the issue, though, some works translate to other cultures better than others. And despite Wingard’s best efforts to westernize DEATH NOTE, it still feels too much like an anime/manga to really make the transition. Wingard’s stamp is undeniably on the film, but at the same time certain elements that would work just fine in anime just don’t come off well here. The character of L, in particular, is the kind of character that just would be fine in an anime, but just doesn’t work here. The other, and arguably bigger, problem is that DEATH NOTE feels like a “Reader’s Digest” condensed version of its source material. Clocking in at just over an hour and a half, there are too many characters and subplots for that running time. In particular, we never really delve into the character of Mia and her psychology. Still, this is an extremely well made film. It may be “work for hire” for Wingard, but he clearly seems to have given it his all. One wants to like it perhaps more than it deserves, and I imagine both fans of Wingard and of the original manga/anime will want to at least give it a chance. Can’t quite recommend it, but it’s on Netflix, so if you already have a subscription you might want to at least think about checking it out. 2 ½ out of 4 stars.